Welcome to Heartonomy.com, the Internet home of a tiny new independent game company based in New York City. 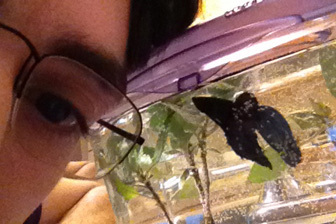 As of now, the Heartonomy team is just myself and my pet fish, Pickler. I have been a gamer since I was a toddler and a hobbyist game designer since I was a teenager. I have worked professionally as a computer programmer both inside and outside of the game industry. Recently I’ve shed enough self-doubt to decide that it’s time to turn my hobby into a career. This post and the launch of this website is the official announcement to the world of what is truly my dream. In this introductory post, I want to share a little about what I hope to accomplish with Heartonomy as a game company. You can expect future posts will dive deeper into some of the topics I touch on here. So what type of games is Heartonomy going to create? Before I can answer that, you’ll need to know a bit about what I mean by “game company”. I consider games to be an extremely broad category, and I use the word “game” loosely. When I say “game” I am referring to any activity that involves the interaction of a person and the world around them. Games can be played with the body and they can be played with the mind. Games can be played outdoors and they can be played on computers. Games can involve large sums of real money or they can be a way to spend some free time. Games can be played alone and they can be played with others. Basically, if one or more individuals are making decisions and/or taking actions, a game is being played. There have been many attempts by authors, academics, journalists, designers and gamers to formalize a definition of “game”. These are valuable efforts, but there’s no need to get too formal here. If you are interested in the topic, I highly recommend Jesse Schell’s book. With such an expansive concept of what a game is, it begs the question, what is not a game? The answer is almost nothing. Nearly all of human experience can be viewed as a series of games of greatly varying depth and complexity. Life itself encompasses all of these experiences so living is the ultimate game. From this perspective, it’s not always clear where one game ends and another begins. I will elaborate on this in a future post on one of my favorite topics – the concepts of micro (mini), macro and meta games and how they relate to each other. At the core of all games are one or more people (players) who are participating in an activity (playing). Each of these players have their own goals and objectives. Common goals often result in cooperation between players. We can see this when a presidential candidate works with his campaign advisors toward the common goal of getting elected just as clearly as when friends playing Halo 3 Team Slayer cooperate to get 50 kills before the other team. Similarly, opposing goals create conflict. Presidential candidates must challenge and debate their opponents in order to gain support of voters just as the members of the opposing teams in the Halo 3 match are trying to kill each other while avoiding being killed. The major difference between these two examples is what is at stake. In the presidential election, the stakes are high. The winner becomes the president and the loser becomes just another politician. In Halo 3, the stakes are low. The winning team members see a boost in their rank and get to feel good about the win while the losing team members feel bad as they see their rank drop. But despite the huge variance in the stakes of different games, the actual moment to moment experiences of playing any game contains within it some universal truths about what it is to experience life. So now that you understand what I mean by “game”, you might be scratching your head, trying to figure out how Heartonomy is a company about experiencing life. Well, it is and it isn’t. Heartonomy is a video game company (in “video games” I include all computer platforms – PC, web, console, handheld, tablet, phone, arcade, etc). It’s obviously impossible for a single company to focus on the entirety of life experience. There are two main reasons we will focus on video games. First, they are primarily used for recreation, which means the stakes are low and they are ripe for experimentation. Second, video games and web applications are probably the most rapidly developing and evolving form of games right now, which allows us to start small. Video game development offers an incredible opportunity to explore and experiment with the very fabric of living. Computers have enabled developers to incorporate all forms of media into the games we play, and the internet has enabled us to play and interact with anyone in the world. The many diverse and viable platforms we have today means games of any complexity on any subject matter can find an audience. This is the best time in history to be a gamer and a game creator and I am excited!